There is a slow yet sure resurgence of traditional Indian fabrics – from Pochampally to Ikkat to Patola, Maheshwari and more that is changing how the apparel industry is working. Tradition is coming back strongly and there is a change that is susceptible as far as apparel is concerned. Likewise, apparel exports of what is truly Indian are also gaining momentum. In order to keep these products trending in the market, there are designers who are using traditional textiles and fabrics in order to make contemporary fashion statements. While silk and cottons have been prevalent, linen has gotten a recent thrust and many designers and fashion icons are moving towards linen and promoting it. Saris in linen have become a recent phenomena with weavers being able to weave sustainably with linen as a fabric. Parisera has been reviving craft and the natural traditional fabric by creating market demand, elevating these to luxury and making it relevant to the modern Indian woman. Traditional textiles are revived using the age-old skills and making it contemporary in textures, colours and aesthetics which will appeal globally and to the new-age generation. Vasundhara Mantri & Aayshya Jhunjhunwala, Co-founders, Shaadilogy.com say, “with many successful designers promoting these fabrics in the global market the demand of these in abroad has consequently increased as there are a number of NRI’s who would want to get a touch of their culture on special occasions, also look classy and elegant at the same time.” As a country, Indian fabrics are varied and the country is home to many traditional ones. Patola for instance is a double Ikat woven sari usually made from silk, made in Patan, Gujarat, India. “They are very expensive, once worn only by those belonging to royal and aristocratic families. These saris are popular among those who can afford the high prices velvet patola styles are also made in Surat. Patola weaving is a closely guarded family tradition there are three families in patan that weave these highly prized double ikat sarees. It is said that this technique is taught to no one in the family, but only to the sons. It can take six months to one year to make one sari due to the long process of dying each strand separately before weaving them together,” says Rosy Ahluwalia, Designer, Hollywood & Bollywood Fashion. 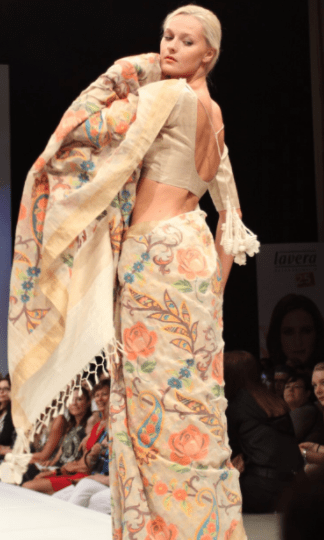 The resurgence of fabrics like khadi has slowly started to associate itself with Indian markets as a balance between traditional and modern identity. Maheshwari handlooms is one of India’s most well-known handcrafted textiles loved the world over for its fineness, delicacy and sophistication. Like all handwork, much imagination, labour and patience go into its making. “The government’s ‘Make in India’ initiative is giving a new lease of life to some relatively-unknown varieties of indigenous fabrics. Thanks to the efforts of designers and some state governments, fabrics such as ikkats and Uppada silks are being adopted and revived, as are the more popular Banarasi and khadi varieties. There have also been labor law reforms for workers in the textile industry. As a result of current Government involvement through monetary support and application of various progressive and well-being schemes, this sector has been able to withstand race from the power loom and mill sectors,” says Mehra. The major challenge is getting the new generation of weaves to work in handloom weaving, and for the master craftsmen to do modify their age old designs and make contemporary textiles. The biggest challenge that the market faces is that there are limited people who would understand and value the craft. Challenges also come from the mass -market and also the western culture that has influenced today’s generation. “Also there are many substitutes of these products which are available in really cheap prices and hence the value for the authentic traditional fabric is been challenged at every stage. Consumers want products fast and at cheap rate and this is fulfilled by many markets that deal in substitute products as it is easier for them to produce them in bulk. Many companies also come out with screen printing which overpowers the efforts put in by artisans to hand create the fabric,” aver Vasundhara & Aayshya. The challenge for hand weavers now is to make age-old quality hand woven more marketable. Hence, the commercialization of traditional weaving has become the project of hundreds of cooperative societies and private enterprises, and of the Indian government itself. Given the relentless nature of mechanisation and mordernisation the handloom sector is undergoing changes that are impacting the livelihood of the weavers. Handloom weavers are facing severe livelihood crisis because of adverse government policies, globalisation and changing socio-economic conditions. The national and state governments do have several schemes pertaining to production inputs, market support and development, meant to protection the welfares of the weaving community. Fruitless operation of the schemes and the changed context of textile industry, increasing competition from the power loom and mill sectors have been largely responsible for the crisis in the handlooms. Lack of information to weavers regarding various policies and schemes is no less a significant cause for the dwindling fortunes of the weaver community.